When the roads get rough, stay smooth with soft premium materials, contoured shapes and a highly customizable interior design. Make your Grandland X the ultimate you-zone. Smart choice or bold statement – choose a trimand add on features that work for you. Leave your friends speechless by showing off your stylish 2-tone-roof1. Add more charm with the stunning panoramic sunroof2. Sunny days will never be the same, they'll be better! Music for your eyes. Illuminate the center console and front doors of your Grandland X1. The smart AFL (Advanced Forward Lighting) LED headlamps1 provide 30% better visibility than halogen lights. This increased night vision will improve your safety significantly. Full confidence, even in confined spaces. Advanced 360° cameras1 detect objects that are in the way. You'll see what's happening on screen, making parking and backing out a breeze. Never fear a tight spot again. 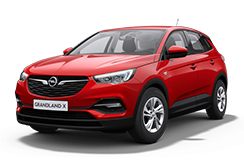 Activate the system1 by pushing a button.The Grandland X takes control of the steering wheel while you keep command of the acceleration and braking. The ergonomic seats, certified by the "Campaign for Healthier Backs" (AGR)1 offer superior seating on long trips. Frost will melt away with these heated features. The kick-operated power-liftgate1 systemopens quickly and easily either with a swing of your foot under the rear bumper or with the push of a button. The FlexFold™ seats offer a 60/40 split as well as a ski pass-through1 for even more versatility. Plus, with the push of a button the 514 liter trunk space expands to 1652 liters. A motor that matches your needs – now you can have it in the Grandland X. Thrust yourself towards your next adventure in a dynamic, smooth and efficient ride. Improved gear shift smooths out ride and reduces idling vibrations. All models of the new GRANDLAND X make a smart use of space and offer top-class luxury at every trim level. *Models display additional standard features and wheels. Premium equipment for an elegant feeling. Increase your driving pleasure with more features. Top of the line luxury. Our dedicated team of highly trained technicians, our skilled sales team and our management completely committed to service excellence makes us a leading Opel dealership based in Middelburg, Mpumalanga. Contact us for all your New and Used car sales, service and support queries.